It is rare that we repeat menus. We do make many of the same recipes from time to time however an entire menu has to have a certain affinity for it to be repeated. This is one of those menus. We hit upon the combination some years back and it stuck. Oh, the pork product may swap with ham or roast pork loin but more often than not we end up with kielbasa, pierogies and succotash. Some people keep a recent copy of the New Yorker or TV Guide next to the arm chair, I keep food magazines. We subscribe to several and we keep most of them. Cook’s Illustrated is a favorite and they are often our go to source for recipes we know will deliver. When I saw their recipe for Weeknight Roast Chicken I thought ‘how clever, I’ll have to try that’. As a picture is worth more than 999 words here is the result. As simple as the recipe is (to summarize – high heat oven, preheat oven and pan at same time, rub chicken with oil, salt and pepper, add chicken to hot pan, cook) it was not without a few challenges. The first problem was the smoke alarm going off. Apparently I’m not nearly as good at cleaning the inside of my oven as I am at cooking things inside my oven. 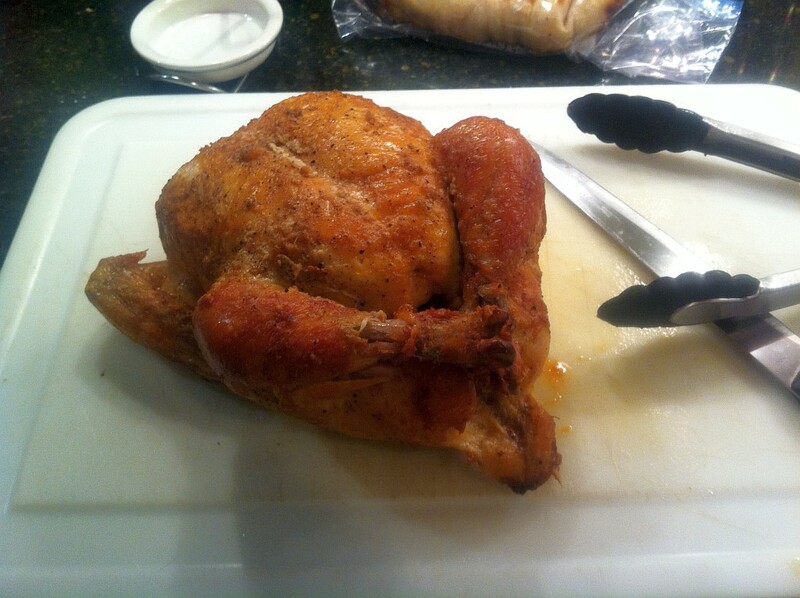 The second problem was that the lovely crisp skin lost it’s crispness while the chicken rested. It was sad really because it was such lovely crisp skin. The final problem was that the breast came out a bit dry. The dark meat was still succulent though and everything did cook through at the same time. In conclusion it was a good effort and worth a repeat… sometime after the inside of the oven has been cleaned. My husband’s extended family was in town so we had a few of them over for dinner instead of our usual crew. Other than an onion and the olive oil everything in this recipe came from the Mass Local Food co-op or our garden. I’m kind of proud of that for some reason. It helped use up some leftover rice as well, which was a bonus. Heat olive oil in a large skillet over medium heat. Add onion and pepper, stir to coat. Cook for 3-4 minutes and add the garlic. Stir in and cook until aromatic, about 1 minute. Push the onion/pepper/garlic to the outside of the pan and add the ground pork. Break up the pork, season with salt & pepper and cook until no longer pink. Remove any excess oil and then combine with the onion/pepper/garlic. Add the tomatoes & chopped herbs (but not the basil), stir and cover. Cook for 5 minutes. Remove the cover, stir and add the beet greens. Cover again and cook for 5 minutes. Uncover, stir and add the rice. Cook until heated through, maybe 3 or 4 minutes longer. Stir occasionally to prevent sticking. Add the basil, give it a final stir or two and taste for seasoning. Adjust salt & pepper if necessary and serve. This year we grew 3 types of tomatoes – red grape, orange cherry and green zebra heirlooms. The smaller grape & cherry tomatoes are cut in the half while the green zebras as cored and diced. Their all really tasty no matter how you cut them (or dont’). For the past year or so we have bought some of our groceries from an area co-op called Mass Local Food. Mass Local Food provides an virtual farmers’ market once a month where farmers list what they have available on a website. I can place an order and then pick it up at a location near me on the way home from work. I love the variety of products that are offered and find the stuff I purchase to be of a high quality. Here’s a list of what I bought most recently – beets, cabbage, garlic, celery root, Hungarian wax pepper, ham, ground pork, country-style pork ribs, sweet Italian sausage links, beef bones, butternut squash, potatoes, smoked cheddar, black-eyed Susan plants and a fresh flower bouquet. Other things we’ve bought in the past include whole wheat flour, eggs, vegetable plants, pesto, ground lamb, whole chicken, corn meal, kale, assorted cheeses, tomatoes, honey, onions, baked goods, a fig tree, radishes, rhubarb and brisket. Things available through Mass Local Foods that we haven’t tried – yarn, coffee, jams and jellies, maple syrup, a ton of health and beauty products, pet food and vegan baked goods. The prices are a bit higher than I’d pay at the supermarket for some things. The trade off is I know what farms the products come from. I know my purchases support farmers in my home state. Those things are important to me and I can afford to pay a bit extra for them. If you live in central Massachusetts I encourage you to check out the Mass Local Food website and learn more. They have pick up locations in Berlin, Framingham, Hardwich, Holden, Sterling, Westminster and 2 locations in Worcester. Give it a try and I bet you’ll be longing to place your monthly order. We were out of town last week and somehow it seemed like we were away for months. It was nice to cook a big meal for friends again; very satisfying. A general principle I have for our Saturday night gatherings is limit the new recipes to one, two max. I really enjoy cooking something I haven’t made before. That said there is always something not quite right, especially in cookbook recipes from professional cooks. The timing isn’t quite right, I don’t have a key ingredient for another, prep takes longer than I guessed, the balance of flavors is just weird, etc. At least if I only tackle one new thing I can usually work around it. If this post had a subtitle it would be “The Accidental Side Dish”. I was aiming to make tabbouleh to use up some of the bounty of cherry tomatoes we arrived home to find. I’m not entirely sure what went awry however the result was pretty tasty. I served this with some pan seared chicken thighs. One side note – You know how in most recipes you are told to prep everything first and then start cooking. Well I want you to ignore that for just a second. Before you start peeling & dicing get the bulgar started. It takes the most time of this dish. Starting it before doing the rest of the prep will save you time. Some days it is all about multitasking. So read the recipe through and then undertake step 1 in the directions below. After that you can get to the dicing. In a saucepan combine the bulgar wheat, water and a pinch of kosher salt. Heat on high until it boils. Cover, reduce to a simmer and cook for 10 minutes. Prep the shallot, chile, garlic, limes and place them in a medium bowl along with the olive oil. You want a bowl large enough to hold all the ingredients which can be easily stirred. Add approx. 1/2 teaspoon of crack black pepper. Hold off on the salt for now. Stir to combine. When the bulgar has finished cooking spread it on a baking sheet lined with paper towel and allow it to cool for ten minutes. I did this because the bulgar still seemed very wet. Once the bulgar has cooled add it to the bowl along with the halved tomatoes. Stir to combine with the other ingredients. Give it a taste and adjust the salt to your preference.